Following the overwhelming Arab defeat and the total occupation of Palestine, including Jerusalem in the Arab-Israeli War of June 1967, the Palestinians countered with a guerrilla war - the Resistance. I was in Beirut at the time, cut off from home and family, and working for UNRWA the United Nations Agency to support Palestinian refugees in the audio visual section. When our our film group went to the Jordan river to film the stream of Palestinian refugees fleeing the war, I tried entering Palestine. I said "Salam" (Peace) to the lone Israeli soldier posted there on the bridge. He replied smiling "Shalom" but with his gun prevented my return to Jerusalem, my birthplace, and to Ramallah my home. Later in Beirut I worked in the UNRWA-UNESCO Institute of Education as an illustrator. Meanwhile as a graphic designer and typographer I was helping the Jordanian sculptor and poetess Mona Saudi produce her book In Time of War Children Testify of drawings and anecdotes by Palestinian refugee children from Baq'aa refugee camp in Jordan (Published in 1970 in Beirut jointly by the PFLP and Mawaqif, the journal of the Syrian poet Adonis, which Mona co-edited). I scripted the entire text of the book by hand using an early version of my AlQuds font. Mona had contacts with the PFLP, and had the idea to change the Fa of the logo to the Arabic letter Jeem for Jabha (Arabic: front). This I implemented using the distinctive curved letter jeem from AlQuds. 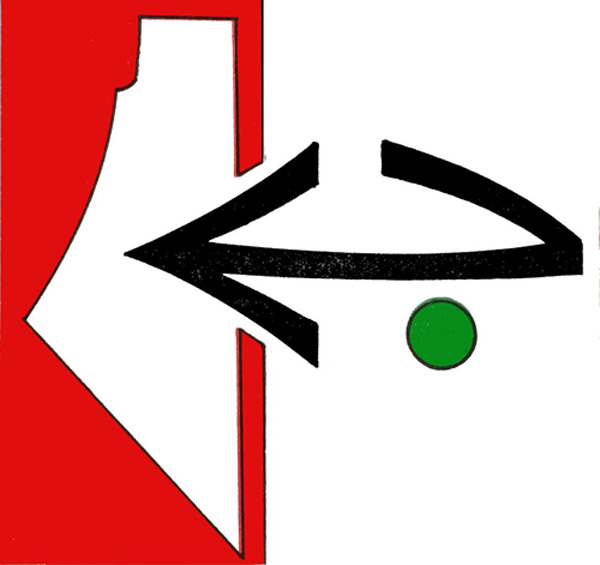 Mona took the logo suggestion to Ghassan Kanafani, the spokesman for the PFLP. Kanafani, the famed Palestinian novelist, was also a gifted amateur artist and he immediately understood the impact of the symbol and had it adopted by the group, after changing the square format to a circle. People in the movement liked the logo and as the years and decades passed it appeared in all sorts of posters, flags, wall graffiti everywhere in and outside Palestine. Needless to say, my having designed the logo did not mean I condoned what I soon felt were some serious mistakes made in the name of Palestine, such as the targeting of innocent civilians. In a spirit of disillusionment I left Beirut for good, and emigrated to Japan where I limited my activities for Palestine to designing posters, giving talks, and the like, devoting myself to my art and inventions. I had met both Kamal Nasir (the cousin of my brother-in-law) and Ghassan Kanafani. Once in Ramallah Kamal with his wonderful spirit, urged me to follow my dreams whatever the cost. Both he and Ghassan were assasinated by Israeli agents in Beirut, in 1972 and 1973 respectively. Their political work ended with their deaths, but their great novels and poems live on as a treasured part of the Palestinian cultural heritage. In 1976 my father obtained a permit to allow me and my family to visit him my mother and sisters in Ramallah then under Israeli occupation. On the bridge on the Jordan River I was arrested by the Israelis and detained in Jerualem for three days, where I was questioned about my above-mentioned activities then released. After three months I was not allowed to renew the permit to be in my own my homeland and had to return to Tokyo.